Indoor Ropes Course- OFF THE CHAIN WORKOUT! i LOVE when i find a workout that doesnt feel like a workout. The type of workout that’s just something you do for fun and it happens to burn calories…. like roller skating or biking at the beach… or kayaking… or an indoor ropes course! I had never been to one of these kinds of places, honestly, hadnt even heard of one! but the minute i did, i knew i needed to go! I saw Xtreme Action Park while driving along the highway one day. It’s located in Fort Lauderdale, Fl. I wasnt sure how i had never noticed this giant building but I found out they only reopened a couple months ago after the previous business was closed for several years. The place is cool. Think of Dave & Busters. The arcade isnt quite as big as you might find at D&B, and rather than a full menu they just have a snack bar, but everything else is SO MUCH COOLER! (and that’s saying a lot because I am deff a Dave& Buster’s fan). So what do they offer? A full bar. A bowling alley. An AWESOME indoor race track. Lot’s of games. Private rentals for parties. 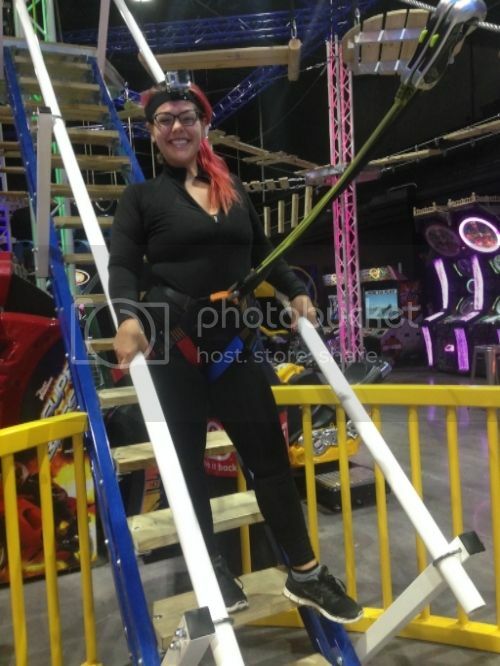 and dun dun dun dunnnnnn….. an indoor ropes course!! The course is about 20-25′ off of the ground. There are two places to go up for come down, but there’s no set pattern to how you have to do the obstacles. It’s totally possible to skip obstacles you don’t want to try, you wont ever get stuck somewhere with only one option. I went around noon on a week day and there was only one couple on there with me. I don’t think it is something I would enjoy quite as much if there were a bunch of kids up there, which i would imagine on the weekends. Nothing to do with the kids, but they would make me a little extra nervous for sure! I had so much fun and was so excited to get home and see my Go Pro video! When I got home I realized i had somehow moved it before starting and the whole thing was facing the wrong direction! Since i had so much fun, I used this as an excuse to go back the next day and do it again! To my surprise when I went back I found out thursdays are Ladie’s Night (all day) and ladies are half off, so rather than $20 it was only $10! Nice! The second time around was definitely a bit less scary because i didnt have to wonder “am i strong enough? am i balanced enough?” I already knew I could do it. 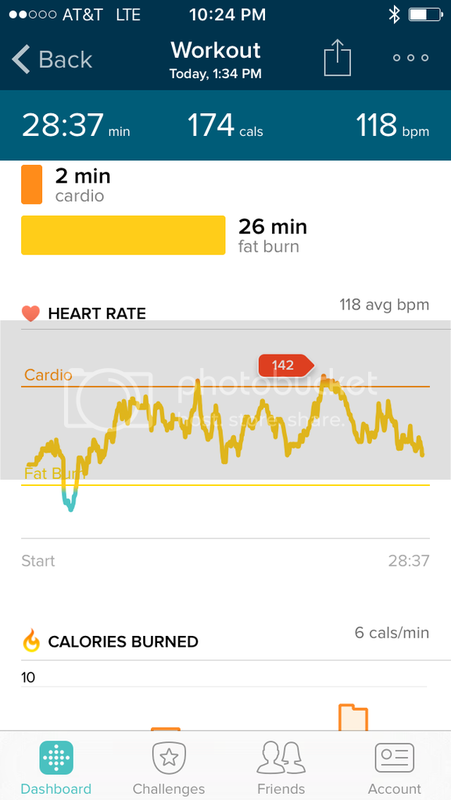 The difference in my heart rate from the first time to the second was crazy, though. 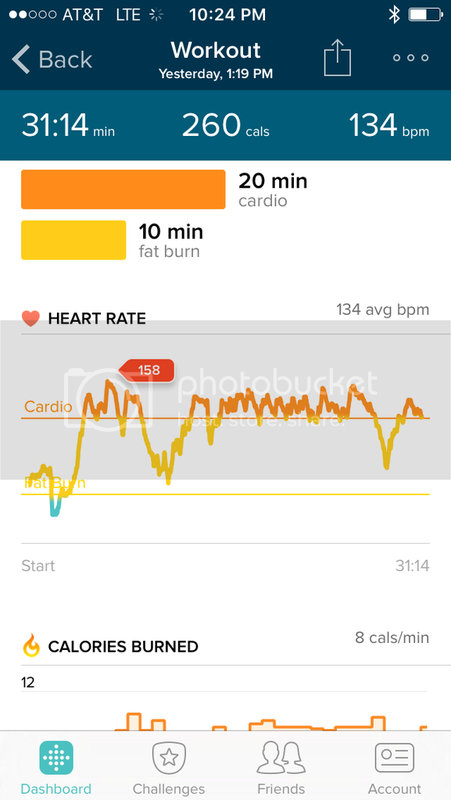 The first time, it was beating so fast my Fit Bit thought i was doing cardio. That was all fear LOL the second time around my heart rate was much lower, but I definitely still got an equal workout. SO would I recommend the Ropes Course at Xtreme Action Park or an activity center near you? Absolutely! I can see myself as a regular here! Such a great way to have fun, step out of your comfort zone, work your muscles, and burn some calories! How Birth Control is Making Me a Fcking NUTCASE. Chef’d Delivers Yet Again! Soba Noodles & Tofu! Foam Rolling: How & Why? LIVE Demo TUES JAN 12! EDIT: Playback is up and live! Crappy quality camera and least flattering angle of all time, but great information! Enjoy! Got one of those foam rolling things and no idea wtf to do with it? youre not alone. ive heard that a thousand times! you may know, foam rolling is one of my most favorite things! The first trainer I ever worked with, Cyndee Krantz, taught me how to use it. i have used this technique to fix so many “ouchies” and prevent injury for years now, and I want to share what I know with you! On tuesday January 12th at 8pm eastern time I will be broadcasting live on YouTube! Simply come back here and watch the embedded video or visit my youtube channel! If you won’t be free and miss it, don’t worry! It’ll uploaded to my channel afterward and you can view at your convenience, just won’t be able to ask questions live, like viewers can on tuesday. Need a foam roller? Your local sporting good store will have one or you can order one here, just scroll to the bottom and click the picture! Before you say “You havent worked with Rob, how can you make such assumptions” know that “it takes one to know one.” It’s much easier to spot a food addict when you are one. It’s much easier to spot someone struggling with mental health when you’ve been there. I understand Rob and have no doubt he will turn this around. I look forward to his comeback!